You need effective assessment items to provide data that can inform instruction and help you make important classroom decisions. Measured Progress has created effective, efficient assessment items for more than 30 years. 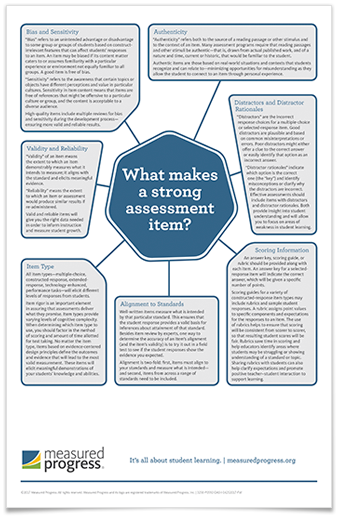 Our infographic provides insights on the 7 key elements of a strong assessment item. Whether you’re reviewing existing items or writing new ones, knowing these elements can help you create more informative, higher-quality assessments. Fill out the form to download a free infographic to print and hang in your classroom or office.